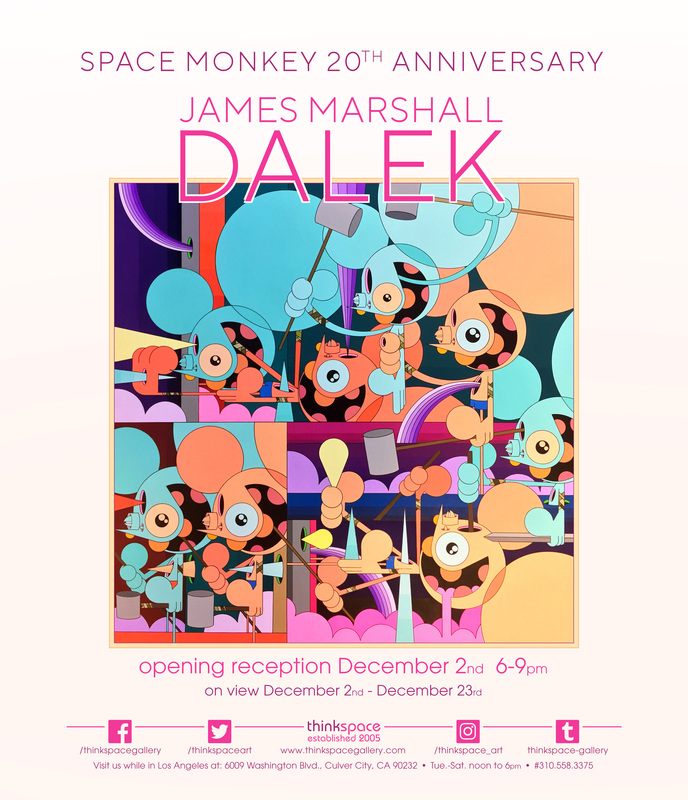 Thinkspace is pleased to present The Space Monkey Returns featuring new works by North Carolina-based artist James Marshall. Also known by his mutant cyborg epithet “Dalek,” an ode to the classic sci-fi British series Doctor Who, Marshall is most widely known for his iconic character “Space Monkey,” who first appeared in his early graffiti work in 1995 and was to become a mainstay of the artist’s imagery. This maniacally unhinged looking ball-shaped cartoon mouse, often seen wielding a blood dappled cleaver, is equal parts avatar, alter ego, and geometric abstraction. The figure became an emblem of sorts for the artist and a recurring protagonist used to convey themes in which he was interested. Space Monkey was a stand-in for the idea of the individual caught in a frenetic landscape of technology and misinformation, an obsequious reliance on tech “progress” Marshall felt would, presciently, it should be noted, reduce us all to “button pushers.” Inspired by Marshall’s affinity for Japanese pop, street art, and punk culture, Space Monkey became a vehicle for the exploration of a variety of ideas and themes. Marshall’s practice has since evolved into a highly detailed form of neo-geo, or geometric abstraction, expertly executed with hard-edging and endless gradations of color. Each time-consuming panel can take upwards of 150 hours to paint and attests to the meticulous technical facility needed to create them. At times the Space Monkey has reappeared, or at least the kaleidoscopically dissembled suggestion of his parts, but he has been enjoying a prolonged sabbatical, until now, that is. Marshall’s critically acclaimed paintings, murals, and site-specific public projects have also found new expression in recent installation-based works, pushing his aesthetic into exciting, and transformative, new dimensional contexts. Currently based in Raleigh, North Carolina, Marshall had an itinerant youth and adolescence, displaced geographically every couple of years as the child of a Navy nuclear submarine captain. Having grown up throughout several different cities in the United States, he moved to Japan at the age of 16 and later to Hawaii and Virginia. A constant for the artist amidst all of this dislocation was the sense of community and personal identity he found in the punk and skateboarding countercultures so interconnected in the 80s and 90s. His early style and imagery evolved out of the aesthetics of these subcultures and eventually came to technical fruition after 2001, benefitting from Takashi Murakami’s tutelage while working as his studio assistant. In 2006, Marshall felt constrained by the iconic avatar that had put him on the map and began moving away from the illustrative Space Monkey character towards more complex and abstract geometric works. He has perfected the subtle transition and graded succession of every imaginable hue, creating at times upwards of 40 tonal variations on a single color, all mixed by the man himself. These fine-spun moments of visual transition contribute to the phenomenal level of depth and optical illusion the artist is able to achieve within a simple set of converging hard-edge forms and planes. The works shift imperceptibly as their dynamic surfaces push and pull, flatten and swell, recede and advance; these tectonic planes feel as though they contain physical light, emitting psychedelic halos of electric color. Marshall’s duality resides in the fact that the work is simultaneously planate and intermittent, like something flat that’s strangely self-animated from within. Dedicated to the Space Monkey’s unexpected reprieve from a decade-long hibernation, this special exhi-bition features old, new, and rare works, revisiting the deranged rodent and the extraterrestrial mutant handler namesake that started it all.